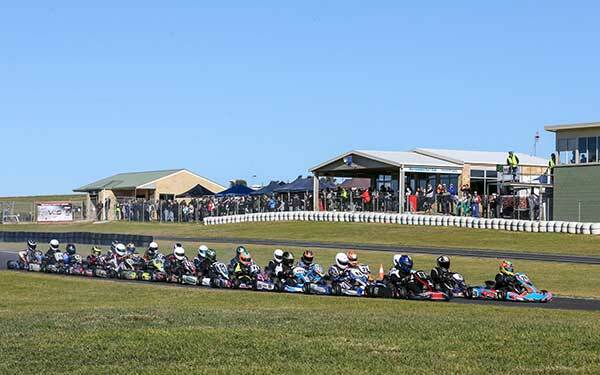 Now with a new series name, the DPE Victorian Country Series Round 4 at Warrnambool was the place to be on July 21-22. 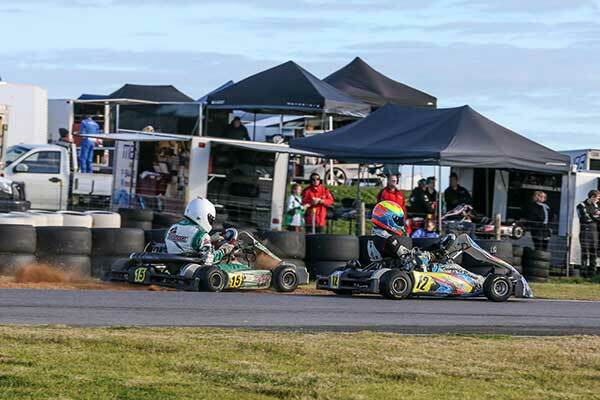 204 entries were accepted by Saturday afternoon, making this the 4th VCS round in a row with over 200 entries, and a fantastic show of support from karters in 2018. Friday was pit setup day for the crews, and the winter weather had all slipping, sliding and sinking in the wet conditions. Fortunately the wintry onslaught did not stay around for the remainder of the weekend, with a window of welcome mid-winter sun coming out to provide the perfect conditions for racing. Unusually the wind was blowing from the north, which aided drivers going up the straight, and in so providing some great overtaking action into turn one before the rapid descent down the hill. Qualifying again was paramount and would set up the rest of the weekend. Times on the board were extremely close between the front runners, this guaranteed spectators were in for some awesome racing to come on the Sunday, and AWESOME it was. KA3 Senior Light was first out the gate and in heat 1 the #25 of Corey Herbertson would lead the field away for the first 3 laps. The #95 of Nathan Williams went from 2nd to 9th and had to work hard to regain back to 7th. #18 Jack Martin seized an opportunity on the 3rd lap at the left hander climbing the hill, and would go on and take the first heat by 1.5s. #43 Taine Venables was at least on track this round to fight it out following a miserable run of fortune at Horsham, after being shuffled to 8th, he made his way back to 5th. Come heat 2, Herbertson and Martin got the jump and streeted away, leaving #40 Bryce Woollard in a comfortable 3rd. Jaxson Cox, Hamish Allan and Tyler O`Leary would put on a cracking race from 3 down until the very end, Venables making the break early this time to cross in 4th. For the final it was all action in the first corners as Martin dropped to 2nd only to regain 1st almost instantly, Bryce Woollard would see 2nd for 3 laps until Herbertson reclaimed it. Cox fell from 3rd to 15th but a steely drive saw him finish in 8th. #86 Nicholas Trebilcock would be the drive of the final starting from 13th he pushed hard to finish in 5th. #13 Aaron Jackson was the closest to the ever dominant #20 machine of Remo Luciani in qualifying, and that was where the fight to try and topple the master began. #7 Chris Thomas also displayed very good speed, matching times of the leader, but the field just couldn’t bridge the gap to overtake the #20, and Remo Luciani would go on to claim all heats and the final. While it may sound like an easy Sunday drive, it wasn’t all easy pickings for Luciani. In heat 2 the finish was extremely tight with Thomas finishing only .16s behind Luciani. In the final Luciani and Thomas would be unaffected by battles of others as Jackson and Branson would dice for 3rd, leaving the rest to fight for the minors. #4 Phil Smith picked up where he left off in round 3 by taking pole and leading heat 1. After a 4 lap battle with the #55 of Andrew Stubbs, the #66 of Ian Branson was on the charge, and in the dying laps of heat 1 he took Stubbs for second while Smith went on to win. Smith started heat 2 very well and tried for an early jump, until he was caught by Branson on lap 6 and would be eventual runner up, with Stubbs claiming 3rd. Branson and Stubbs were the lucky ones to make it through the carnage that ensued turn 1 at the start of the final. 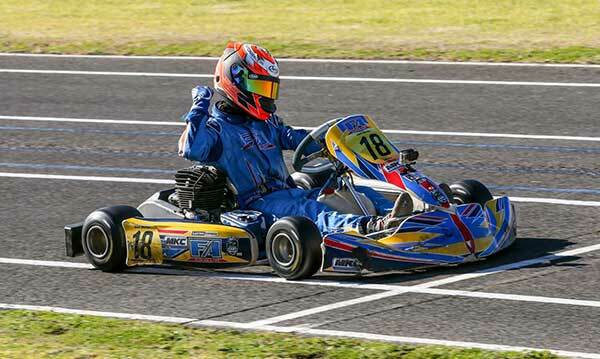 Smith had spun in front of the masters field (without any assistance), leaving the kart facing the wrong way on the middle of the track. 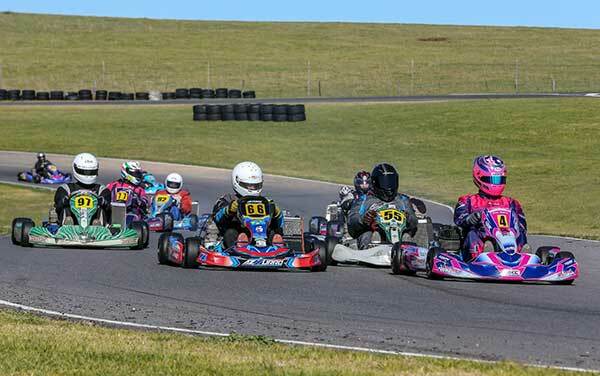 The rest of the field arrived at speed behind him, with karts spraying in all directions and some getting airborne. The fence line looked like a second hand kart shop with half the field out and lined up along it. Lucky Phil would keep going while less lucky drivers in the crash retired; dropping down to 8th before making his way back to 3rd. Stubbsy also tasted a dose of fortune, dropping to 5th to come back to 2nd in the end. 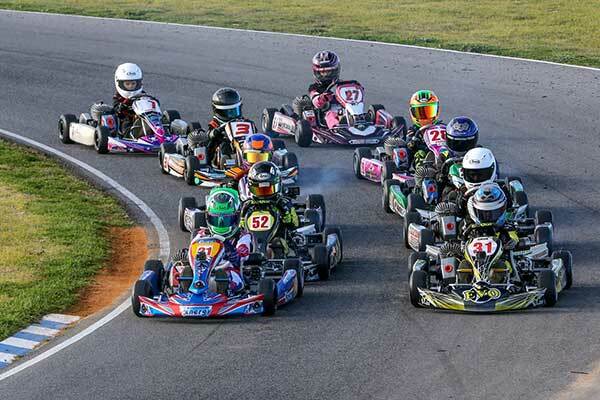 All but 4 karts in the crash finished what was a crazy start to a combined masters final round 4. As commentator I was a little confused in the end with penalties but the finish order on the board was..
#6 Brett Jenkin had the pole, but would soon be looking at the whole field in turn 3 from the sidelines. McPherson would end up with a penalty, allowing the #55 of Cameron Austen to take heat 1. While Sloan would be off position 2 for heat 2, his machine gave up on lap 4 and this elevated all in the field. Meanwhile, Jenkin had worked hard to get from 9th to 3rd in this heat. The start of the final saw a furious first corner with a bit of biff and barge, once this settled the race for position was on. In the dying laps Jenkin had come from near last to be battling with the leaders. With 2 laps to go Harvey and Jenkin came together, resulting in Jenkin spinning out to 8th and Harvey to 5th. McPherson had a lot of battles on his way through the field to claim victory in the end from Austen and Harvey. A big field of RL125`s was at the roller coaster and provided some of the best racing of the meet. With the top 10 separated by just 3 tenths of a second, its was going to be a close fought tussle and heat 1 provided us a glimpse of what was to come. Heat 1 and #86 Aaron Neilson would go round the outside of#53 Riley Meens in turn 1 to an unchallenged finish. Lap 5 would see the #42 of Chambers try to make a move on the last corner at the start of the last lap, but lost control sliding straight through the corner and down to 10th before recovering back to 8th. Heat 2 saw Neilson clean sweep it from start to finish while his main rival Meens was a DNF. #19 Brock Rae went to 2nd and Brother Andrew in the #96 slipped to 9th in the opening laps. #48 Jonathan “Jono” McKean made the best of his opportunity and grabbed 3rd while Max Torcasio and Jeremy Keinsrod were 4th and 5th respectively. The final was epic with positions changing so fast it was hard to keep up. The race settled through midway until around lap 10 the patience ran out and the moves were being made. Brock Rae had jumped to an early lead, but found himself in a battle with Maximo Torcasio. On lap 11 Max would see the lead briefly only to finish 8th. #96 Andrew Rae would make it to second but would also succumb to incident and fell down the pack to 14th , driving back to 6th. #86 Aaron Neilson our early leader also would feel the bite of the dice and dropped to 5th. #42 Todd Chambers started out of 8th and was making his way up the leader board, but that all came to halt on lap 13 while in 2nd. McKean had his battles and made it to 2nd as did Riley Meens; coming from 9th on the grid to take 3rd. This was to be the #28 of Beau Humphrey`s day /weekend with a clean sweep of qualifiying, all heats and final in one of his best performances yet. The #28 was untouchable in the first heat, as was Michael Angwin who took sec 5.8sec behind Humphrey. Heat 2 was clean and clinical for the front 3, Humphrey, Angwin and Ash Mitchell with an arm chair ride to the finish. In the final Angwin got the jump on the outside of the #28 but it didn’t take long for Humphrey to resume command and lead the rest of the way in the end the winning time was 2.1 sec over Mitchell and Angwin 3rd. VCS round 4 was the first Victorian event with the new TAG 125 parity changes. Rotaxes are lighter, X30s are the same weight and PRDs are heavier; which meant TAG drivers left their PRDs at home and it was a Rotax EVO vs New X30 affair. 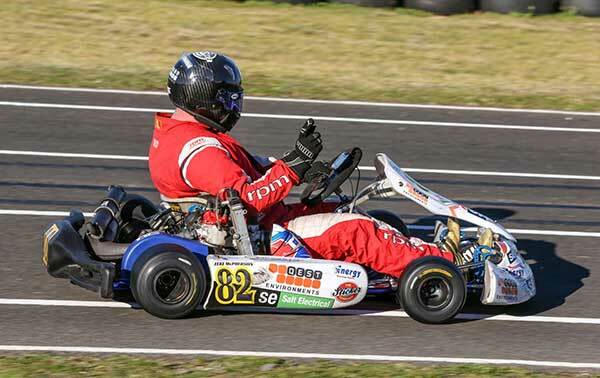 #90 Daniel Richert grabbed pole with the Rotax by 0.051 to take first blood. Come heat 1 the chase was on and #4 Scott King was the man to try. Daniel would take the first with S.King in tow. Heat 2 saw Richert start from 5th due to an infringement in heat 1, but made his way to the front by lap 6. Aaron Jackson would go from first to 4th and Adam King would see 3rd. In the final Scott got the jump at the start on Daniel but only lasted til lap 6 when the #90 took the lead and drove away to claim the day by .7 of a sec. #13 Troy Alger was the stand out in the light brigade with Connor Farr and Anthony Mrhar not far behind in qualifying. Heat 1 and Alger took off like a man possessed to streak the field by 1.8 seconds. Farr was in a battle from the turn 1, 2 and 3 sequence and would come out on the wrong side of the battle, dropping to 5th from 2nd. The #12 of Domenic Romeo had the drive of heat 1 to start out of 12th and get up to 4th. Heat 2 would go to #9 Jordan Rae from #95 Nathan Williams. Williams was caught up in a tussle that would put him down to last with a helmet full of dirt and only regain 2 spots to 11th. #33 Alexander Barallon came from nowhere to cement 4th with a really god drive through the tough field of lights. #2 Maverick Benson would see a brief stint at the rear until he fought back to 6th. In the final Connor Farr had the pace but not the luck and swiftly dropped to 11th but got back to 9th. Kobi Williams was driving like a young man possessed in the first heat and threw the instruction manual over his shoulder and let everyone read it as he drove off in to the distance to win the heat by 2 seconds. 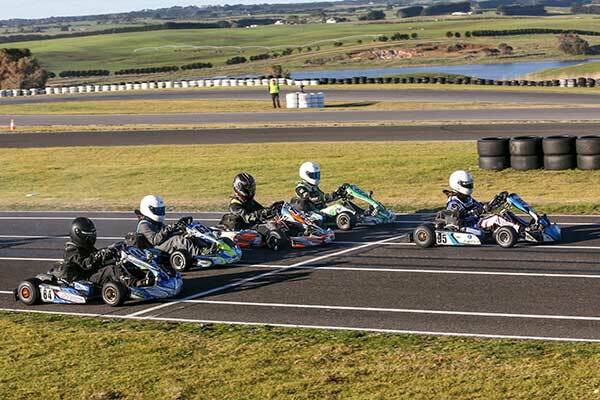 Ethan Bray, Jaxson Johnstone and Ryan Morgan put on a brilliant display of KA3 Junior racing. Heat 2 was pretty subdued considering the first and it seemed the fight had gone from the field as all settled in for the 10 laps. In the final Williams and Morgan got the jump and didn’t look back as the battle raged with Bronson Boult, Jaxson Johnstone and Ryan Bettess all exchanging places through out the 16 lap final to entertain the crowd on the fence. #28 Zaiden Barry would take a convincing pole late in the qualifying session to start the weekend. Barry and Hookway would lead the pack away in a 2 by 2 race in heat 1 leaving the 8 of Ryan Cook by 1.7s. Behind them was an absolute melee of changing positions as the field sorted themselves out. Heat 2 would see the same two packs form, and Barry would take the heat again, only to incur a technical penalty that would drop his final starting position to 7th. In the final Daniel Hookway and Johnny Hill would drive off with a comfort zone while Barry had to put in a big effort and managed to regain 3rd. #15 Joel Johnson made his way quietly from 9th to 4th with good pace, but his run was just a little too late. #33 Aiden Solomon would also have a good drive from 19th to 10th but just wasn’t his weekend. 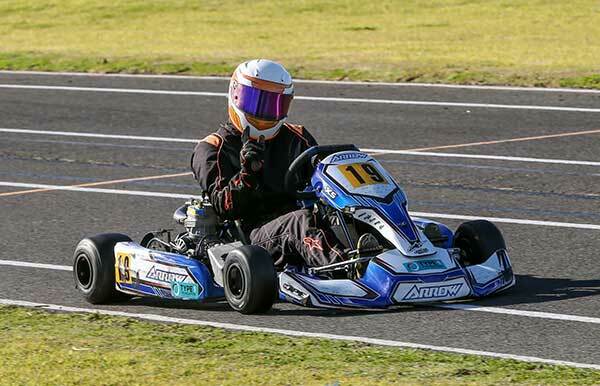 Young Jenson Marold grabbed pole with a solid effort in qualifying. Rusty Ponting was the only other to match the #31 in the high 37sec bracket. Heat 1 saw Marold have trouble getting his machine running but managed to salvage it and lead for a few laps until Rusty the Rocket made his move and drove around a back marker to a 2 second victory. #52 Charlie Evans had an easy drive and was untroubled to see 3rd . Heat 2 was more or less the same as Ponting’ss race craft was on display taking the win again with Evans 3rd once more. The final and Rusty would lead until lap 9 when a focused Jenson Marold made his move on the #21 and would take the chequered flag first for the first time in the series. Evans wasn’t troubled until near the end of the 16 laps where Lochlan Farrell made a decisive move up, and from Ewen Anderson waited patiently to end up with 3rd. #7 Brocklan Parker would take pole from a huge field of 30 Cadet 12s. The #16 of Lacey and the #92 of the “Dominator” Domaschenz were all at the pointy end to have a go at Warrnambool’s seaside roller coaster. Heat 1, turn 1, and Domaschenz would take control and drive on to win. Parker and Lacey would have a cracking battle until the uphill left hander where Lacey went from 2nd to 25th with 2 laps to go. Parker would drop to 4th and 55 Xavier Avramides would seize the opportunity and take 3rd. With 3 to go a full course yellow was thrown as karts were in odd positions on the climb up the hill, and a last lap dash for cash was on. In heat 2 “The Dominator” would clean up from go to whoa, Parker would drive back to 2nd from lap 1 and Thomas Schmidt went from 2nd to finish 5th. The #85 of Tyce Hodge would go from 9th briefly to 3rd and settle for 4th. The #16 of Lacey wasn’t to be seen which meant he would be starting from the rear of the grid for the final. Lacey was the star attraction of the final though, the young master threaded his way through the field to see him finish in 3rd from 27th place on the grid in what had to be the drive of the round. Parker dropped to 5th before a comeback, Schmidt briefly had a taste of the lead before he was shuffled back to 4th. #86 Angus Hall came alive throughout the final and drove a calculated race to finish in 5th , all this after a full course yellow. This was by far the race of the round! The Juniors had come to play and strut like never before. Nicholas Sacco set the pace for the field, Jobe Stewart had trouble sustaining it dropping to 5th in heat 1. #71 Bronson Boult has shown some real pace in this class, and was knocking on the front runners door. However Christian Cowie was the one to keep an eye on, starting the first heat in 9th to come home second. D`Ambrosio went from hero to zero in the same amount of time as the rest got on with the task at hand. Heat 2 would see Cowie clean sweep the field with Sacco in tow. Nerinda Beard was having a great battle with Boult until the horse shoe and Nerinda went a little wide dropping her back to 8th from 3rd. Meanwhile Boult was trying to establish his position and would end up fighting back to 3rd. The passing from the entire field was spectacular to watch in this heat; Boult would briefly have second before Cowie and Sacco went in to battle for the lead, and it changed hands 5 times before Cowie would see the chequered flag. 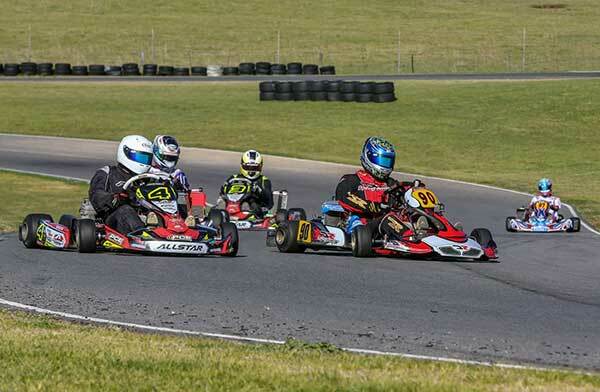 Behind these 2 you had Cooper Johnstone, Nerinda Beard, Jobe Stewart, Joshua D`Ambrosio and Harrison Campbell all dicing like there was no tomorrow with no less than 15 overtaking moves in the space of 4-5 laps made. Cowie got the lead on lap 13 and never looked back, Sacco came home in second and they all made this one of the best races to call so far in the series. 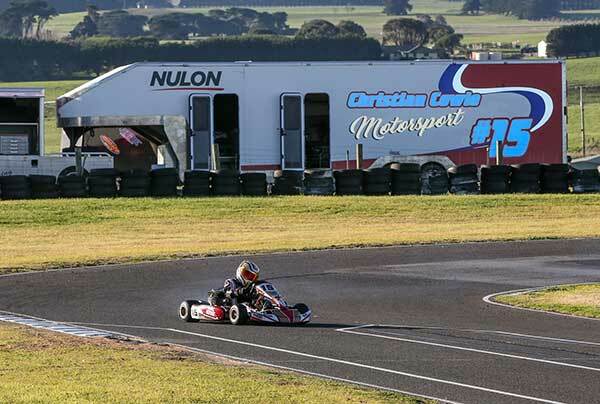 Dunlop Kartsport – Another lucky 7 winners claimed some great Dunlop Kartsport and Rock Oil products at Warrnambool. Each winner picked up some very useful Rock Oil Chain Lube, Brake Kleen and Synthetic or Castor Oil. 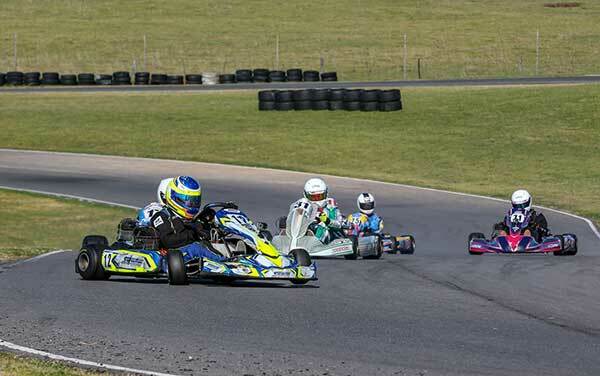 Thanks to DPE Kart Superstores and MG Tires.